1. Melt the butter in a large saucepan. Add the leeks, cover and cook for 10 minutes, until soft but still bright green. 2. 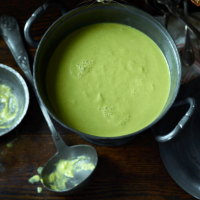 Tip the peas, stock and milk into the pan, bring to the boil and simmer for 1 minute, then remove from the heat. Purée with a hand-blender or in a blender until smooth, then add the lemon juice to taste; season. Divide between 2 bowls.